Dr. Shetty is a Resident in Radiology and Dr. Harisinghani is an Assistant Professor and a Co-Director of Abdominal MR in the Department of Radiology, Massachusetts General Hospital, Harvard Medical School, Boston, MA. 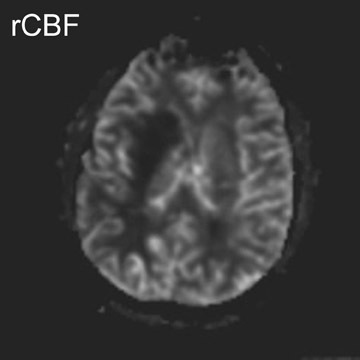 Superior soft-tissue contrast and resolution has made magnetic resonance imaging (MRI) an important tool in the armamentarium of the oncologic imager, providing staging information that predicts prognosis, guides selection of therapy, and evaluates response to treatment. 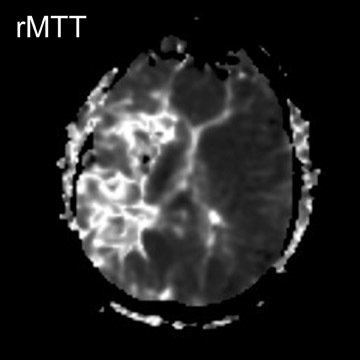 Several modalities have been employed to attempt accurate assessment of tumor stage (T stage), nodal status (N stage), and the existence of distant metastasis (M stage), including computed tomography (CT), MRI, and positron emission tomography (PET). Each modality has its own strengths and weaknesses: thanks to excellent soft-tissue contrast and resolution, MRI has been particularly useful in the evaluation of the primary tumor and detection of distant metastasis. This article will review the traditional methods of lymph node characterization by MRI and will discuss newer imaging approaches that attempt to address the modality's historic shortcomings; these approaches include the evaluation of signal intensity, dynamic gadolinium contrast enhancement, the use of ultrasmall superparamagnetic iron oxides (USPIO), MR spectroscopy, and interstitial application of contrast. 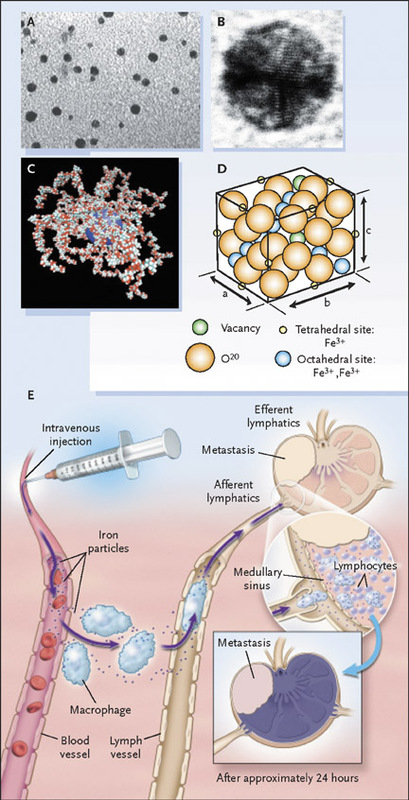 Particular attention will be paid to the mechanisms and oncologic applications of USPIO (also known as lymphotrophic superparamagnetic nanoparticles), a contrast agent with exciting potential supported by a growing body of clinical literature. The traditional approach to MRI of lymph nodes has relied on size criteria to distinguish metastatic from uninvolved nodes. The efficacy of this approach depends heavily on the selection of a threshold size, necessitating a tradeoff between setting a low size threshold (highly sensitive but poorly specific) and a high size threshold (increased specificity at a cost of diminished sensitivity). A range of acceptable threshold sizes has been proposed, which vary in the use of different aspects of nodal measurement, such as long-axis or short-axis diameter, and the application to specific nodal groups. 2-4 Studies using sizes derived from imaging 5-11 and gross specimens 12-14 show that although size criteria can be applied with some success, the approach frequently overlooks metastasis, particularly when the metastasis involves only microscopic or partial infiltration of the lymph node. The specificity of size criteria also deteriorates because of benign inflammatory or infectious lymph node enlargement, leading to incorrect characterization of a benign lymph node as malignant. MR is no different 15 or slightly worse, 5 basing the judgment on size criteria alone, compared with CT in the assessment of regional lymph node metastasis. The addition of morphologic criteria to the evaluation of lymph nodes seeks to exploit changes to the normal ovoid lymph node shape that arise from tumor infiltration. These changes could include either a more rounded shape, in which the long-to-short axis ratio decreases, or eccentric cortical hypertrophy. A commonly used size threshold in the pelvis accounts for this change in morphology, using 10 mm in short axis diameter for ovoid lymph nodes, while using a smaller threshold (8 mm) as a cutoff in rounded lymph nodes. 3 In a study of 4043 axillary lymph nodes in the setting of breast cancer, 16 the use of either eccentric cortical hypertrophy or a long axis diameter >10 mm plus a long-to-short axis ratio of <1.6 resulted in a sensitivity of 79% and a specificity of 93% for the detection of lymph node metastasis, with nearly all false-negative findings in the axillae showing metastatic lymph nodes measuring <10 mm. Application of these size criteria requires detection of lymph nodes, a task that is complicated by motion, the presence of adjacent structures, and limitations in resolution and signal-to-noise ratio. Using a three-dimensional (3D) magnetization-prepared rapid gradient-echo (MPRAGE) T1-weighted sequence, Jager et al 3 reported a sensitivity and specificity of 75% and 98%, re-spectively, for lymph node metastasis in patients with prostate and bladder cancer. However, because their method was dependent on a size threshold for nodal characterization, they failed to detect microscopic metastases in 11 of 134 patients. Using a 3D-fast low-angle shot (FLASH) sequence performed after bolus injection of gadolinium, Hasegawa et al 17 reported 92% sensitivity and 78% specificity for the detection for hilar lymph node enlargement, results similar to those from CT and PET techniques. Continued evolution in MR hardware and development of innovative pulse sequences will improve detection of lymph nodes in increasingly efficient ways; however, even improved detection may not be sufficient to optimize the performance of MRI without a better means of lymph node characterization. The improved soft-tissue contrast and fluid sensitivity of MRI suggest an additional approach to the evaluation of lymph nodes for metastasis: using signal characteristics of lymph nodes in the absence of contrast media as a means of differentiating benign from malignant. However, results with these techniques have been mixed. Brown et al 10 evaluated 437 lymph nodes with high-resolution MR techniques, using a T2-weight-ed fast spin-echo (FSE) sequence with a relatively long acquisition time that took advantage of 4 averaged signals to maintain signal despite the high resolution. They saw no significant difference in size between benign and malignant lymph nodes and achieved a sensitivity of 81% and a specificity of 68% with a size threshold of 5 mm. Adding evaluation of heterogeneous nodal signal intensity or an irregular border improved these parameters such that the sensitivity and specificity for nodal metastasis were 85% and 97%, respectively. However, these results excluded lymph nodes <3 mm and metastatic lymph nodes outside of the field-of-view, a particular concern given the high-resolution techniques employed. In a study evaluating 140 mediastinal lymph nodes in patients with non-small-cell lung cancer, 18 the use of a T2-weighted respiratory-trig-gered short tau inversion recovery (STIR) turbo spin-echo (TSE) sequence allowed differentiation of metastatic lymph nodes with a sensitivity, specificity, and accuracy of 100%, 96%, and 96%, respectively; this technique relied on comparing the signal intensity of a lymph node with a 0.9% saline phantom and compared favorably with T1-weighted spin-echo (SE) imaging and CT (Figure 1). Several investigators have attempted to use the enhancement characteristics of lymph nodes after bolus administration of intravenous gadolinium as a discriminant between malignant and benign lymph nodes. Simple comparison of signal intensity after intravenous gadolinium administration has not been effective in differentiating benign from malignant lymph nodes. 23 A more complex approach relies on a dynamic analysis of enhancement kinetics, based on alterations in tumor microcirculation: flow characteristics and blood volume, microvascular permeability, and increased fractional volume of the extravascular extracellular space. 24 In a study of mediastinal lymph nodes in 9 patients with bronchogenic carcinoma, Laissy et al 25 found peak enhancement in metastatic lymph nodes within 60 to 80 seconds after gadolinium enhancement, with a slow washout thereafter. In contrast, reactive lymph nodes showed gradual increase in contrast enhancement without a peak value in the first 6 to 8 minutes. Using a T1-weighted 3D FLASH sequence with a 44-second acquisition time, Murray et al 26 compared axillary lymph node enhancement to adjacent fat; it was concluded that using the presence of at least 1 lymph node with an enhancement index of >21% and nodal area of >0.4 cm 2 would allow discrimination of patients with axillary lymph node metastasis with a sensitivity of 100% and specificity of 56%. The relatively low specificity was deemed acceptable, because the high sensitivity for metastasis would ensure that all patients with metastasis would undergo surgical axillary lymph node dissection. Using a threshold of more than 100% increase in signal intensity in axillary lymph nodes on initial postcontrast images in 65 patients with invasive breast cancer, Kvistad and colleagues 27 showed an 83% sensitivity and a 90% specificity for correct diagnosis of axillary lymph node metastases per patient. Interestingly, their results showed no improvement in accuracy when additional size or appearance characteristics were added to the evaluation. However, a limitation of both studies was that a node-by-node correlation was not performed, raising the possibility that the abnormalities seen on MR did not correlate specifically with foci of metastasis. 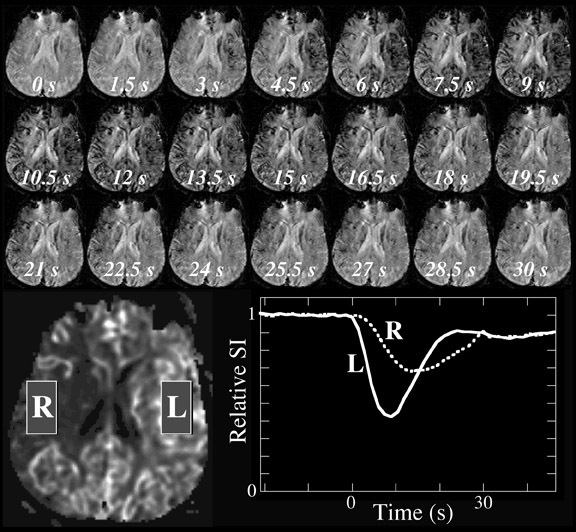 Fischbein and colleages 24 evaluated squamous cell cancer of the head and neck using a two-dimensional fast spoiled gradient-recalled sequence after a single bolus of intravenous gadolinium. Their results are almost opposite from those achieved in other neoplasms: correlating enhancement characteristics with pathologic specimens showed significantly longer time to peak enhancement, lower peak enhancement, lower maximum slope, and slower washout of contrast material in metastatic lymph nodes (Figure 2). Of note, the technical constraints of this dynamic imaging, as well as artifacts related to motion, precluded complete coverage of the entire area of interest and limited the radiologic evaluation to 68 of the 129 pathologically identified lymph nodes. It was hypothesized that, in the specific case of squamous cell carcinoma, tumor tissue may actually have decreased blood flow relative to normal or hyperplastic lymphoid tissue and that squamous cell carcinoma of the head and neck may not have increased microvessel density. After administration of contrast material, the agent is distributed into lymph nodes throughout the body and is usually imaged 24 hours later. The contrast agent distributes symmetrically throughout the body after intravenous administration, which aids in a comprehensive nodal evaluation that does not depend on the site of injection. 38 Entrance into lymph nodes is via 2 mechanisms: first, direct transcapillary passage from venules into the medullary sinuses of lymph nodes and, second, nonselective endothelial transcytosis into the interstitial space, from where the particles drain into lymph nodes via the lymphatic system. 28,29,39 Once within the lymph node, the particles are phagocytosed and subsequently accumulate within macrophages (Figure 3E). This accumulation of the USPIO particles has 2 major effects: a predominant susceptibility effect, as well as T2 shortening, resulting in decreased signal on T2- and T2*-weighted images. 40 The susceptibility effect is most important, with microscopic field gradients that lead to diffusion and loss of phase coherence. There is also a T2-shortening effect caused by local field inhomogeneities that promotes transverse relaxation. 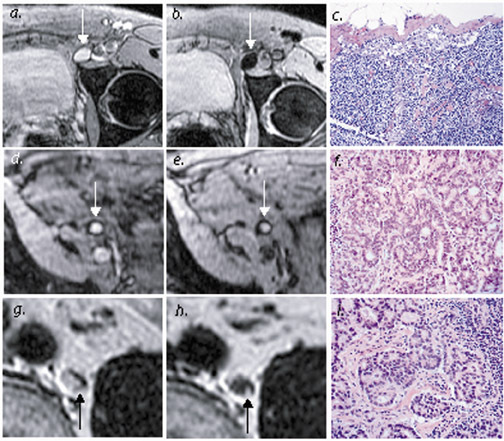 The end result is that USPIO is a "negative" contrast agent, one which is taken up by benign lymph nodes with preserved nodal architecture; this "negative enhancement" appears as decreased signal intensity on T2- and T2*-weighted images. 36,41 This accumulation of USPIO in these normal lymph nodes corresponds to the macrophages in the medullary sinuses rather than the lymphocyte-rich follicles of the lymph nodes, as shown on 9.4T imaging. 30 In contrast, areas of metastatic nodal infiltration lack reticuloendothelial structure and macrophages and therefore do not accumulate USPIO, resulting in a lack of uptake in all or part of a malignant lymph node 36 (Figure 4). Metastasis is therefore identified in lymph nodes that are either entirely or partially unchanged in signal intensity on T2- and T2*-weighted scans. The use of USPIO agents for lymph node applications requires evaluation in the context of particular primary neoplasms and body regions, because the challenges encountered in the MR imaging of various body parts are unique. Direct comparison of the many clinical trials of USPIO is hindered by marked variations in MR technique and different methods of statistical analysis. Differences in MR technique and operator experience alter the ability to detect and analyze signal changes in lymph nodes. Published statistics are usually based only upon nodes with radiologic and pathologic correlation, often excluding very small nodes (1 to 3 mm) that are seen at pathologic analysis only; this precludes direct comparison with gold standard surgical techniques and somewhat undermines the confidence in staging based only on noninvasive methods. These studies also use different benchmarks, including performing analyses at a patient, nodal group, or individual lymph node level, complicating direct comparisons. Despite these limitations, however, a growing body of literature allows us to evaluate trends in the results of USPIO-enhanced MR and to highlight the promise of the technique. Harisinghani and colleagues 32 reported on a large population (80 patients) with prostate cancer, where USPIO-enhanced MRI significantly increased sensitivity for detection of lymph nodes, from 35.4% to 90.5%. Specificity was also increased, from 90.4% to 97.8%. These results were particularly notable for the 45 of 63 metastatic lymph nodes that did not achieve traditional size criteria for malignancy but which were identified with USPIO. Careful attention to lymph node identification relative to anatomic landmarks allowed precise correlation with MR images (Figure 4 and Figure 5). In summary, the benefits of USPIO-enhanced MR imaging seem to be greatest with certain areas of the body, including the head and neck, axilla, retroperitoneum, and pelvis. Evaluation of mediastinal lymph nodes suffers from the prevalence of granulomatous and other infections, decreasing specificity of the UPSIO-enhanced technique, as well as from technical limitations imposed by motion and susceptibility. 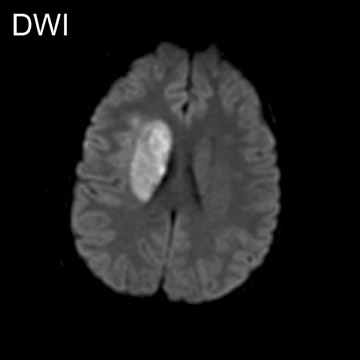 Several areas of investigation are critical: correlation of USPIO staging results with outcomes and treatment, evaluation of the cost effectiveness of the technique particularly given the logistical considerations of a 24-hour delay between contrast administration and imaging, and specific delineation of methodologies and MRI protocols for optimal use. Increasing clinical experience will permit more accurate comparison of USPIO approaches as applied to different neoplasms and clinical situations. Continued improvements in MR imaging will also further improve the technique, particularly through improved spatial and contrast resolution that will allow identification of smaller lymph nodes and micro-metastases without overly detrimental loss in coverage or noise. 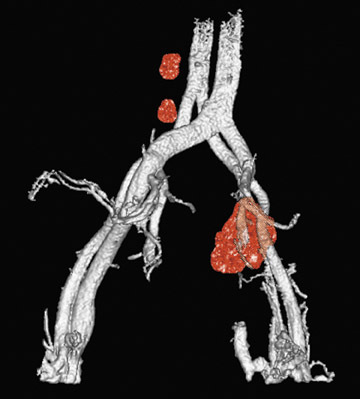 The interstitial administration of MR lymphangiographic contrast agents represents a different approach to visualization of the lymphatic system on MR. The enhancement of the lymphatic system (including both lymphatic vessels and nodes) permits identification of the drainage pathway and possibly a sentinel lymph node that can be targeted for biopsy. Alterations or abnormalities in lymphatic flow can also be used to directly diagnose lymphatic metastasis, in a manner similar to conventional lymphangiography. However, these techniques sacrifice the more global lymph node evaluation afforded by, for example, intravenous administration of USPIO agents. 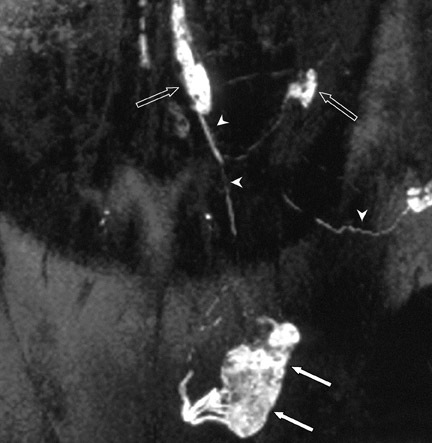 The technique is also susceptible to concerns that arise from conventional interstitial sentinel node detection techniques, including radiolabeled sulfur colloid and methylene blue, in that the sites of injection may not truly reflect all potential drainage pathways of the primary tumor under study. A benefit of these agents is that they work primarily to promote T1-shorten-ing and therefore increase signal intensity on T1-weighted sequences, creating "positive contrast" images of lymph nodes and lymphatic vessels. There are also potential benefits of lower contrast dose and reduced systemic side effects of contrast. Preliminary work has shown experimental success of this technique with several agents, including MS-325 (a paramagnetic agent with novel chemical groups that promote reversible binding to albumin, increasing intravascular half-life), 61 conventional gadolinium agents, 62-64 and macromolecular gadolinium polymers and aggregates 65-70 (Figure 6). The field of MR oncologic imaging represents an exciting application for current imaging techniques, offering important information with definite clinical implications, including prognosis and treatment selection. 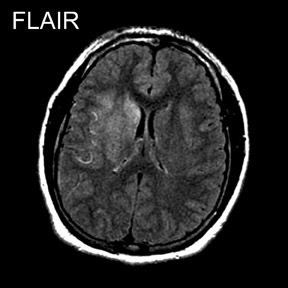 The traditional strengths of MRI, with improved soft-tissue contrast and delineation of tissue planes, are related to staging of the primary tumor or detection of metastasis. Extending its value as a modality for the evaluation of nodal status may increase accuracy of staging or even allow for a single imaging evaluation that includes the primary tumor and adjacent lymph nodes. As detailed in this review, several approaches have been developed that seek to improve on the results obtained with traditional size criteria alone; each of these has shown promising results in attempts to image the function and physiology of lymph nodes to increase accuracy. Unfortunately, direct comparison between different approaches (or even between different studies using the same approach, as in the case of USPIO) is hindered by marked differences in technique and methods of analysis employed in various investigations. As the experience with each approach grows, it will be easier to draw more accurate direct comparisons and identify the appropriate role of each. With inevitable continued technologic improvements, lymph node imaging will no doubt continue to represent an exciting frontier in MR, with the potential to have a large impact on future clinical practice. Magnetic resonance techniques in lymph node imaging. Appl Radiol.